So far we’ve profiled Creative Commons international volunteers in Hungary, Taiwan, Chile, France, Catalonia, Spain, Malaysia and Peru. 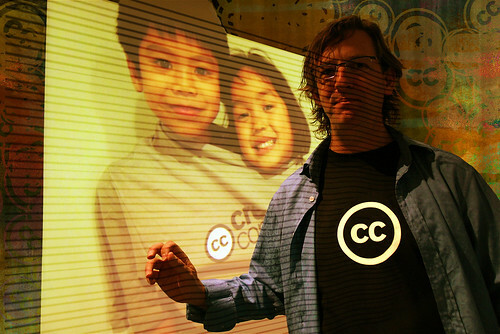 Today we’ll stay in South America with Creative Commons Argentina. Please donate in support of scholarships for our international project volunteers. Read letters from Lawrence Lessig explaining the campaign and an exciting new opportunity. (4) Librecultura, to work together with the free culture movement from Argentina and Latin America. From Bienes Comunes and Creative Commons local community, they are also planning other projects to work with commons in the bio/nano-technology. Together with other organizations, Bienes Comunes collaborates to protect natural environment and promote a balance of access of the common basic resourses. For example, there are more than 40 albums with CC in Argentina; in Negocios Abiertos there is a video about that and uses of CC licenses for music in Buenos Aires. In the editorial field, during these months is starting Libros Abiertos (Open Books), a new initiative of books under free licenses for Latin America. 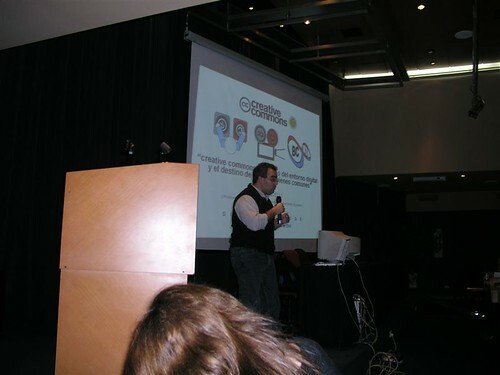 Ariel Vercelli speaking at Día de weblogs 2006. Photo credit Irene.F / CC BY. Give $75 or more to foster collaboration among our outstanding jurisdiction project volunteers and get a hip t-shirt! Photo credit MikeBlogs (remixing cambodia4kids) / CC BY.